well if u saw me earlier post where i told the story of how i destroyed my hubs...here are the pics! Its not a good trip unless stuff gets broken. awesome. ^^^ thats right! i kno all about that... sweet pics looks like a lot of fun! Glad you got them out! I swear, some people think that just cause they have JEEP on thier vehcile, that they can make it through anything Im not saying that your friends are like that, but those people definetly exsist! Good pics, looks like ya had fun other than the carnage. Tractors are always nice esp FORD tractors. I had a guy pull me out with a tractor smaller than that it was an old Ford 800 model. I told him I couldnt make it down the hill, and didnt even want to think bout getting out. he said, "If ya start spinning I run get the tractor and pull ya right out". I wish I had seen his tractor b4 I got stuck, b/c he would have had to tote the lumber down the hill. Anyways I backed the 550 2wd down the steep slick hill that I had to make a turn at the bottom still at an angle. At the bottom of the hill I slid into some trees, couldnt go forward or backwards. Rubbed some trees almost ripped off a TT mirror and reflectors on the body. He almost turned the tractor over trying to pull me the rest of the way out after I dumped the lumber off. Anyways he was happy, I was happy I got out, nobody got killed and I didnt tear the truck all to hell. All in a days work I guess. PS. What is that up in the tree above the black 150 in the 4th pic?? Overall it looks like a geat trip!! It looks like it was on a military base? I noticed the camo a few were wearing and the marine front license plate. Please promote "4 vehicles Stuck offroad pics!" 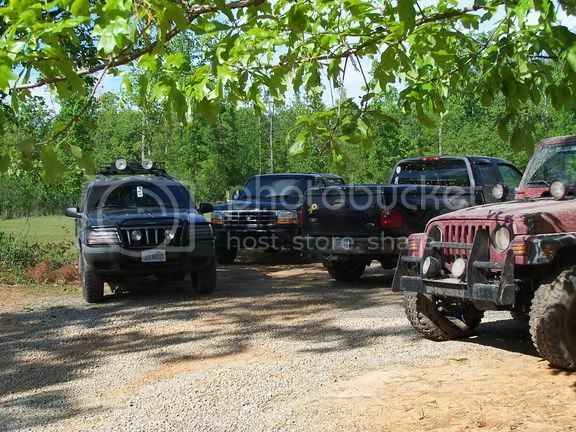 Forums : Off Roading : 4 vehicles Stuck offroad pics!